Home Accessories New CY8CKIT-023 iPhone and iPod dev kit by Cypress! 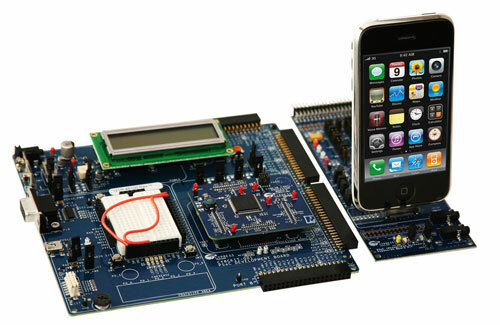 New CY8CKIT-023 iPhone and iPod dev kit by Cypress! A company called Cypress has announced the development and availability of a new iPhone and iPod dev kit for accessories called Cy8CKIT-023 PSoC Expansion Board Kit for iPhone and iPod. The kit uses a PSoC with a programmable system-on-chip architecture, iPhone OS, the OS of other Apple products and the iPhone SDK to provide two-way communication between the dev kit and the device. The kit includes a MiniProg3 debug and evaluation device, prototype cabling kit, USB cable, 12V AC adapter, PSoC creator and PSoC Designer software. The kit features capacitive touch sensing controls, LCD segment drive and other features for developing audio docks, speakers, chargers, and produce for automotive use. Additionally it has it's own display for providing meta data and more. The kit is available for 249 (USD).